A pair of upsets and sweeps highlighted the opening round of the Hockey East Tournament as extra hockey was abundant in round one. Five overtime periods in 10 games made for an exciting weekend, but there’s little time for celebrations from the winners as the semifinals await. The conference top seed and No. 3 nationally ranked UMass spent game one playing catch-up before breathing a collective sigh of relief with a double-overtime winner over eight seed New Hampshire. Corrected mistakes made for a lopsided second game as UMass stormed to a 6-0 win for the sweep. The talk of round one, seven-seed Boston College bested two-seed and then-nationally No. 7-ranked Providence for two wins in three one-goal games. Three seed and now No. 6 nationally, Northeastern’s defensive game controlled play for a pair of 2-1 games over Maine. Five-seed Boston University made for another upset from a Beantown team with a shutout of UMass Lowell in game one and a 3-1 series clincher on Sunday. The 2019 #HockeyEast semifinal start times are officially set! All games @tdgarden. See you there. The single-game semis kick off Friday and you can catch the excitement live, right here on FloHockey this weekend. 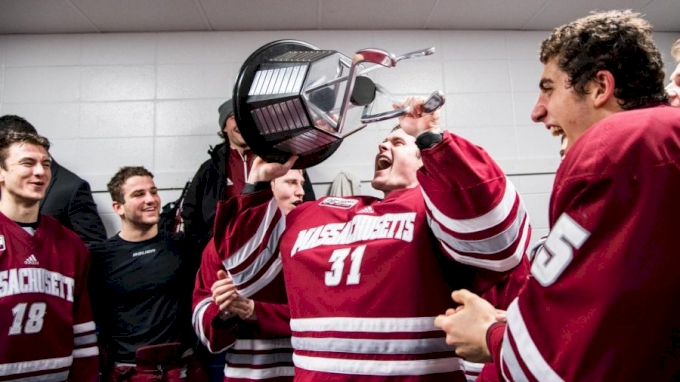 It was a rocky start to the postseason for the powerhouse that is the UMass Minutemen, but after a 5-4 double-overtime winner in game one, they returned to form as the nation’s No. 3 team on Saturday. Hobey Baker hopeful Cale Makar scored the opening goal in the second game and added two assists for a 6-0 thrashing more in tune to the Minutemen’s capabilities. The sophomore is proving too good for the NCAA and too much to handle for opponents. Add in senior Jacob Pritchard, who posted six points (2 G, 4 A) in the sweep, and the Minutemen have two game-changers rolling into the semifinals. The Eagles pulled off a stunning upset over Hayden Hawkey and the nation’s No. 7 team, downing the Friars in consecutive games after falling Friday. It was the Eagles’ first winning streak since the beginning of February. They seem to be adjusting to having played 15 of their past 18 contests against nationally ranked programs. Sophomore Logan Hutsko (2 G, 2 A) and senior Michael Kim carried the load this weekend and led the team in scoring against the Friars. Both of Hutsko’s tallies proved to be game-winning goals. Kim’s two goals and three assists led the Eagles and came after a 13-game scoreless drought. The pair, along with team-leading scorer David Cotton, will be leaned on again this weekend. Prediction: Boston College will be up against a very different team than the Providence squad form last weekend, and containing the Minutemen’s offense will prove to difficult in such a short series. Expect a UMass win. Ranked No. 6 in the nation, Northeastern’s sweep doesn’t tell the entire story of their weekend. Maine proved to be a difficult out with Jeremy Swayman allowing just four total goals. But as has been the case since mid-February, his counterpart, Defensive Player of the Week Cayden Primeau, swallowed up nearly everything that came his way. Primeau has now surrendered two or fewer goals in eight of his past 10 starts, including two shutouts and four one-goal games. Northeastern’s balanced offense shone through; with 12 possible points to be rewarded, 10 different players recorded a point in the sweep. Six players have double-digit goals this season and that depth will be pivotal this weekend against BU. The Terriers were up against a slumping UMass Lowell, but deserve full credit for the series victory over the then-No. 18 team. As predicted, NHL prospect Joel Farabee—along with Patrick Curry and company—led the way for the upset. Farabee (4 G, 1 A) and Curry (2 G, 3 A) led the offense with five points apiece, while the defense combined for three goals and 13 total points. The next series will fall on Farabee and Fabbro again, but they’ll need a supporting cast to join them in order to solve Primeau. Prediction: BU’s problems with consistency this season will see them fall in this one-game semifinal. Stream the tournament semifinals live, right here on FloHockey this weekend to catch all of the Hockey East action.